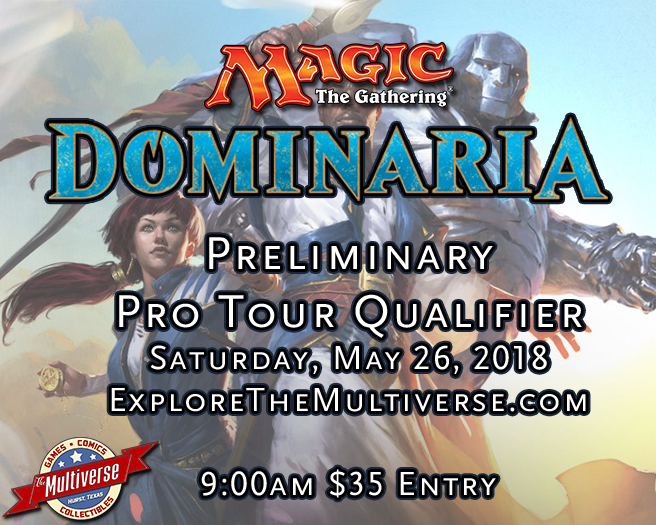 Qualifying Tour: Atlanta 2018 Date: Saturday, May 26th, 2018 Registration Starts: 9:00am Tournament Starts: 10:00am Format: Sealed (Dominaria) Entry Fee: $35.00 Attendance Cap: 60 Players Location: The Multiverse Comics, Collectibles, & Games Address: 431 W. Bedford Euless Rd #B, Hurst, Texas, 76053 Phone: (817) 952-3553 You’ve proven yourself a formidable opponent at Friday Night Magic. You’ve tested your deck-building mettle at the Drafting table. Now is the time to show the Planes what you are really made of. Join us for an Atlanta 2018 Preliminary Pro Tour Qualifier! There will be a food truck on site for you to purchase lunch from 1:00pm – 3:00pm with no break between rounds. There will be a draft to determine standings for Top 8.